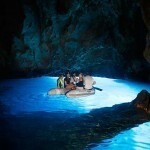 Inside the Blue Cave you will be overwhelmed with all the shades of blue color you can imagine. 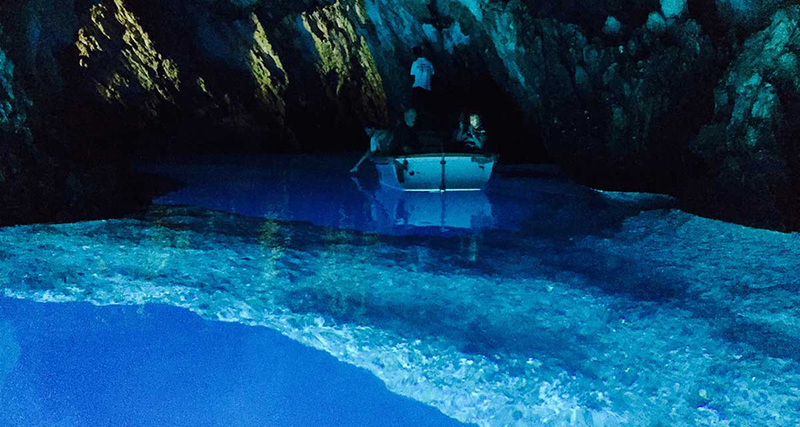 The first stop of the Blue Cave tour from Split is a distant island called Biševo whose popularity is mostly due to the presence of the Blue Cave it hides beneath the lime stone rocks forming this small island. 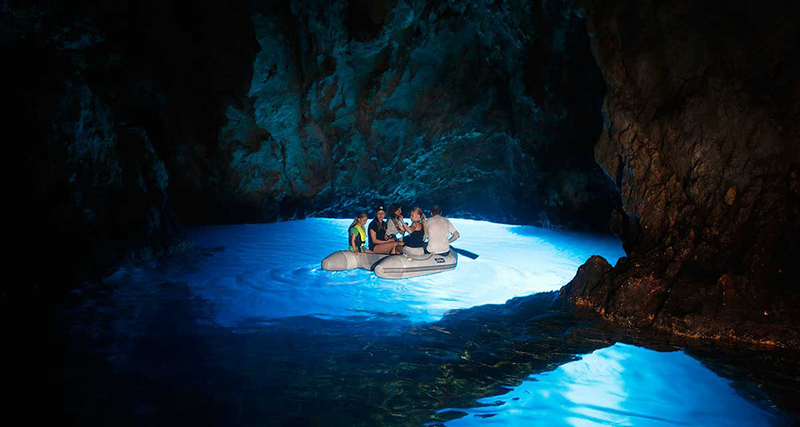 Blue Cave,Blue Grotto or as it is locally called Modra Špilja is a Croatian Natural wonder for a good reason. 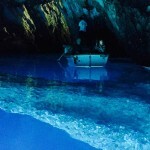 With well over 70,000 visitors last year Blue Cave is at the top of the tourist attraction list of this part of Adriatic. 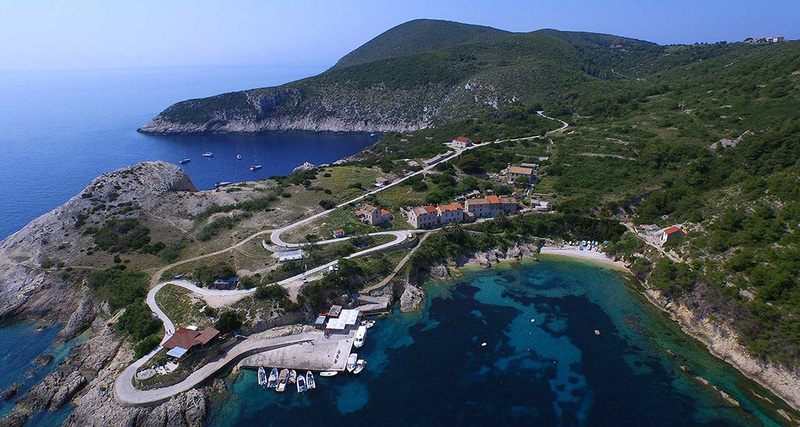 But what is it that compels so many visitors to arrive at the shore of Biševo island and take part in the blue cave excursion? 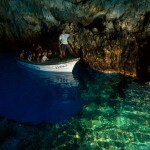 Before the year 1884, the only possible way to enter inside the Blue Cave of Bisevo island was through the underwater entrance which is the only natural entrance to the cave. It is not known who was the first who dived under and discovered the Blue Cave but it was thanks to Baron Eugen von Ransonet of Austria that the cave was first described, painted and presented to the general public to marvel upon. 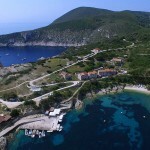 It is also thanks to Baron Eugen von Ransonet that the cave entrance above the sea level was created in 1884 allowing small boats to enter it which ultimately gave rise to the popularity of the Blue Cave of Bisevo. 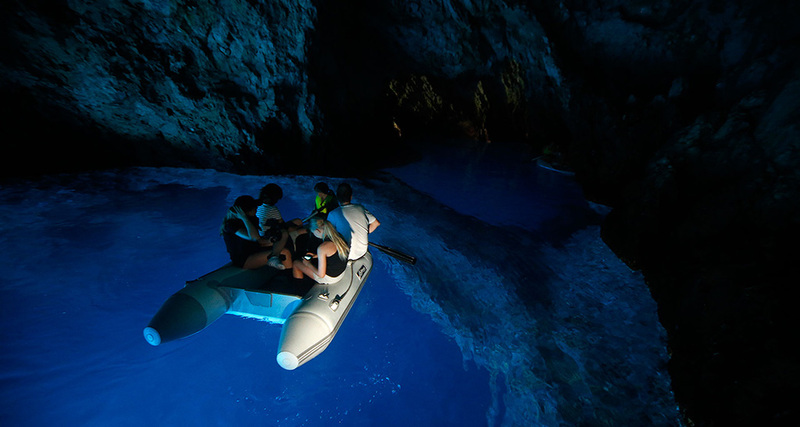 More and more people came to visit the cave and it became a true competitor to the Blue Grotto (Grotta azzura) of Capri for the title of the most beautiful Cave in the World. 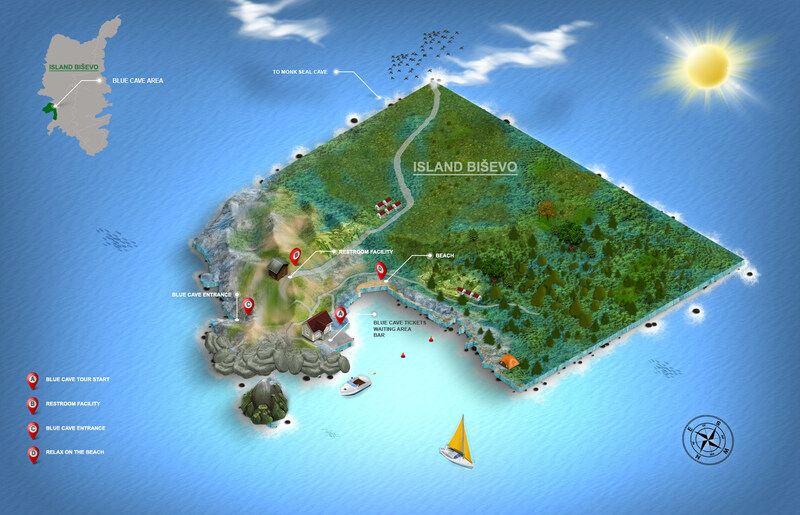 As we arrive at the Biševo island which is located just outside the island Vis you will be handed your Blue Cave entrance ticket which is included in the price of the Blue Cave tour. From there you will board a small local wooden ship and be taken on a 5 minute ride towards the Blue Cave entrance created in 1884. 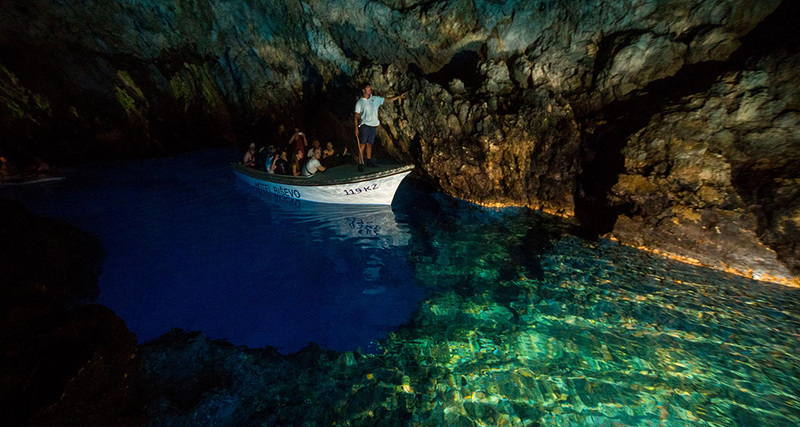 No matter how many times you have seen photos of the Blue Cave, no matter how many videos you have seen of its flickering blue light, no matter if you have even personally entered the cave before, you will surely be struck by its beauty and tranquility the moment you enter it and find yourself inside the blue belly of this small Croatian island. 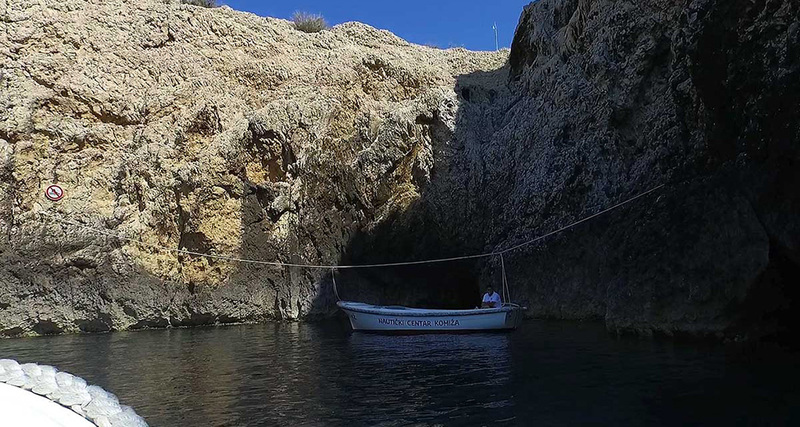 First experience you will have is definitively when you see the small entrance to the cave wondering if your boat will really be able to venture inside of it. As the boat passes the cave entrance you will find yourself inside the dark corridor lit only by the small entrance light behind you. As you clear the dark corridor, the marvel of the Blue Cave presents itself in front of you in all its glory. All shades of blue you can imagine, silver sea bottom and the peacefulness broken only by your tour guide as he presents and describes the cave to your group. 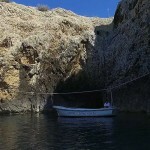 The cave is made out of two chambers divided by the stone bar visible just below the sea surface. The entire cave is around 25 meters long with the cave ceiling towering some 15 meters above you. 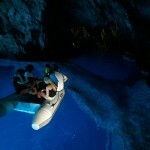 The sea depth of the cave varies from 10 to 12 meters depending on the position. Even though it is considerably deep, the silver reflection of the sea bottom makes it look as the cave is much more shallow. As you circle around the cave and listen to the stories told by the tour guide you will exit the cave on the same place you have entered it with the feeling of awe and happiness you were lucky enough to experience the beauty nature decided to create just off of Vis island.